Professional anthropologists frequently occupy unique roles, simultaneously inside and outside the organizations we work for or work with. Most of us are already adept at negotiating these roles, but don’t necessarily highlight this skill as something of great value, either to professional ethnography or to the broader intellectual life of anthropology. We should. Our role in the broader field of anthropology often remains marginal and our position—at once inside and outside, betwixt and between—is somewhat precarious and vulnerable (eg, Reddy 2012 touches on this, as do some of her guest bloggers). But it also affords opportunities. Professional anthropologists cross and complicate existing boundaries: collaborating with, debating, struggling with, writing about, negotiating, navigating and translating between different dynamic audiences. Embracing our hybridity is a powerful recognition that our difference is relevant and valuable. I offer here a story of my experience as a professional anthropologist working on a public non-profit project to provoke discussion around alternative approaches members of the EPIC community might consider for both thinking about our unique position in the industries we work in and especially for engaging in broader intellectual anthropological conversations. This case study of a “para-ethnographic” approach describes and builds on the multiple roles I inhabit in an ethnography and redesign project. More specifically, I want to try to articulate the value of a para-ethnographic trajectory that might unfold from occupying multiple positions in a set of related projects. In framing this story, I hope to strategically open avenues of dialogue with a broader anthropological audience, especially academic anthropologists. This is important because this anthropology discourse plays an important role in framing who we are, or perceptions of who we are, as anthropologists. While I recognize that some professional anthropologists are not particularly interested in engaging with this anthropological conversation, many are. And in my experience, I have consistently found that academic anthropologists are intrigued with what we do as professional anthropologists, but cannot always find a forum or common ground, theoretical or analytical, for building conversation. This article is an attempt to reach toward that broader audience. Business processes of all kinds have traditionally been led by dedicated experts; for example, marketing experts who re-strategize a brand or architects who design a retail space. Yet these activities are increasingly open to collaborative team efforts today. From technology and finance to consumer-focused industries and the non-profit sector, a general trend toward diversification and collaboration is prevalent throughout our economy and society. Within this broader movement, these processes also are increasingly including experts with “para-ethnographic” sensibilities—that is, people who think, act or analyze culture, community, identity and social behaviors in ways similar to anthropologists, but who may or may not necessarily have any formal academic training in anthropology. Design processes and projects of all kinds are a prime example, such as at the intersection of designers who brand experiences, and branding professionals who help design experiences. In an ideal situation, inserting a cultural anthropologist in the middle of this process could help the overall project bring together insights from design, business, culture and social or behavioral science. At the same time, in many situations, designers and strategists with para-ethnographic sensibilities are adequately filling this role of bringing disparate discourses together, interpreting relevant cultural contexts and adding value to the process. This trend may lead some of us into a debate about the validation of the value of ethnography or “thinking like an ethnographer” and perhaps even the need to professionalize or sanctify our identity as anthropologists. But we might also consider another, more inclusive question: how might this growing engagement with ethnographic sensibilities and ethnographic ways of thinking in collaborative business or design processes impact the way we think about and describe cultural and social life? As first described by anthropologists George Marcus and Doug Holmes, a para-ethnographic approach promotes anthropological inquiry focused on collaborations among or between anthropologists and “other sorts of experts with shared, discovered, and negotiated critical sensibilities” similar to those of ethnographers (Marcus 2000). This type of approach can lead to uniquely recursive and collaborative research designs, where the traditional subjects of ethnographic inquiry become not just informants, but also co-producers of theory and ethnographic analysis. In many ways, what’s striking about the approaches Riles, Marcus, Holmes and others are describing is their similarity to the work that many in the EPIC community already understand well and engage in, either as consultants to client groups or positioned inside of larger organizations and corporations (e.g. Cefkin 2010). Design ethnographers, for instance, may note that considering their subjects as interlocutors is common practice. In the EPIC community, we are almost always taking up multiple positions as ethnographers and interlocutors, co-creating, engaging and debating with our clients and fellow team members—the best of whom could be considered para-ethnographers or, in colloquial terms, people who “get it”—in order to produce new knowledge, advance projects, build relationships and create recursive loops that continually re-engage us in new projects that build upon our prior work. And this is precisely the point: the EPIC community is already located at or near the foundation of this important cultural trend, and we are well-positioned to shine light on how this works. To be sure, collaboration is not as rosy as it may sound, but again, professional anthropologists are extremely well situated to understand and describe the everyday challenges of these intellectual and practical partnerships. 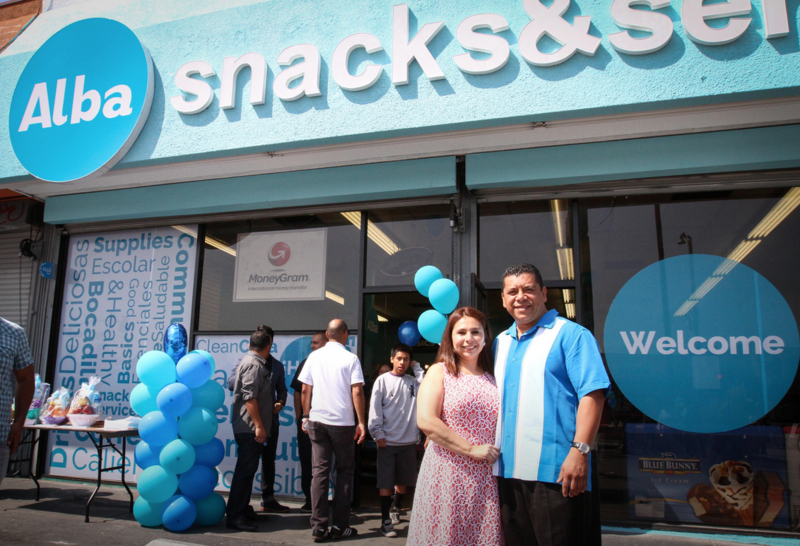 In 2013, I began contributing to the development and organization of a unique collaborative “market makeover” of a South Los Angeles corner store. The project was intended to help local food justice groups counteract the increasingly recognized problem of “food deserts” in low-income areas. These food deserts are under-served by food retailers who, in the words of policymakers, could “provide access” to fresh produce and healthier food choices for the local community. In Los Angeles, successful, expansive and ambitious market makeovers have already been accomplished, such as the work of Public Matters. What was unique about this project is that I am not part of the food justice movement, but a professional cultural anthropologist experienced in retail innovation and branding efforts for major food retailer companies. I work for a strategy and design firm. For the most part, our firm creates prototype supermarkets and food retail experiences, as well as builds brand cultures for medium to large food retail chains throughout North America. I decided to use this experience to assist the food justice movement in confronting the food desert issue. Interestingly, my initial attempts to help were thwarted by food justice groups who considered my corporate consulting with a degree of suspicion: wasn’t I working with the enemy? In addition, the strategic design project experiences I described were considered too expensive and dramatic for what most groups had the capacity to do based on their previous market makeover projects, some of which involved simply placing displays of fresh produce in a corner store wherever ample room could be found. Left: A corner store makeover’s unchanged exterior in the Bronx, New York City. Right: Bins of potatoes and onions are placed next to the door of the Three Amigos Market in Oakland as part of the Healthy Corner Store Project. After over a year of reaching out to various groups through networking, I eventually struck on a collaboration with an amenable team at the LA Food Policy Council that was open to exploring different approaches. In the course of this small market makeover project in South LA, I assembled a team of experienced retail designers with whom I had professional relationships to work alongside community development experts already at work on the makeover. This group expanded and innovated on the preconceptions of a market makeover project, which had its origins in the food justice movement and not the food retail world. Foremost among these new ideas was to focus on healthy snacking rather than the fresh produce category more generally, because in my experience working with convenience store chains and consumer packaged goods companies, I had learned that most shoppers in smaller food retail environments purchase products for “immediate consumption” rather than ingredients to take home for kitchen preparation. This represented a significant departure from how prior market makeovers introduced products into corner stores. This industry insight was further verified by our team’s in-store observations of shoppers and in-depth interviews with the storeowner. Not only did I bring “corporate” strategy insights to bear on a local corner store, but I helped facilitate an exchange of ideas between professional/corporate food retail discourse—which largely lacked an awareness of how to affect the health of low-income communities—and food justice discourse, which lacked a background or experience in the world of food retail branding, strategy, operations and merchandising. Further, whereas prior cases of market makeovers introduced fresh produce into food retail spaces in ways that did not affect or attempt to engage with the rest of the store environment or the outward expression of the store’s presence, this project added the goals of rebranding and renaming the store, developing a new strategy for the business, and redesigning the entire retail experience. These objectives were animated by learning and insights from industry experience. And so, the $1 Warehouse became Alba Snacks & Services. A distinctive brand identity was created, transforming the store’s exterior into a streetside beacon for the brand and transforming the store’s interior into a simple, streamlined experience.The store’s entire inventory was accounted for, simplified and rationalized into product categories. A distinctive and health-focused Snack Zone was created in the store layout. A new, open counter replaced the plexiglass bunker that had been the cashier station. The storeowner continued to struggle with all of the proper accounting necessary to lift his business to the next level, but the immediate results of our work were promising. Revenues are up, though profitability is still a struggle. The storeowner is now out of debt. He has hired two full-time employees. And for the first time in his adult life, he and his wife went on vacation. Other important results were less quantifiable: the Alba store was increasingly recognized as a proud feature of the local neighborhood and a go-to spot for the community. It is not clear yet how much healthier shoppers are eating. Well beyond the scope of the strategy and design program, Staff at LAFPC and elsewhere have extended the project in new directions; for example, one initiative built relationships between a local high school and the store. 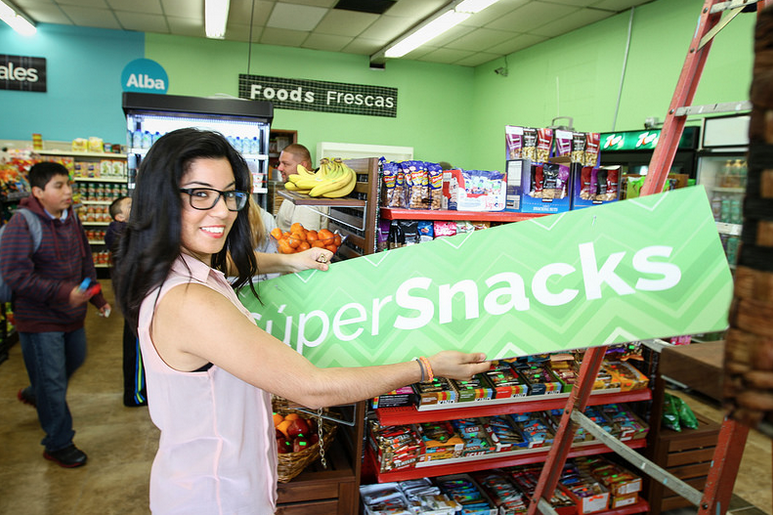 Another group has sought to develop a more innovative platform for creating a supply chain of healthy snacks to other corner stores in the food desert. The Alba store has become an innovation model and a symbol for the food justice movement to talk about, debate, explore, expand on and engage with. 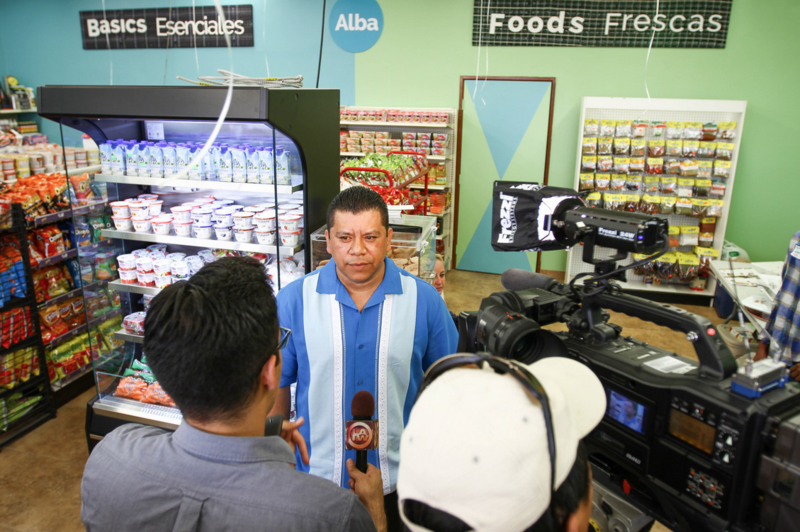 LAFPC has invited other corner storeowners and food activists to tour the store, and has brought the store owner to events to speak to the public about the importance of healthy food retail in South LA. How do competing discourses merge or collide in this site, including local non-profit interests, public policy, design, corporate branding, food retail and professional ethnography? How do retail brands work, distinct from but complementary to a growing and increasingly robust cultural anthropology literature that focuses on classic consumer product brands? How might innovations in food retail actually have a positive impact on the health and eating habits of a community in a food desert? In other words, I had the ability to create an ethnographic fieldsite, as well as the ability to ethnographically study it. In the course of this twofold project, I serendipitously encountered a fellow cultural anthropologist, Hanna Garth, working on an ethnographic project examining the emergent food justice movement in Los Angeles. Coming from an academic environment at UCLA, Hanna was seeking examples of market makeover projects to use as a fieldsite. Recognizing our common interests, we decided to form an ethnographic collaborative team to study the project, and we are currently writing about it (Garth and Powell 2013). This is where things get a little bit blurry. In my role doing research alongside Hanna, I am a fellow ethnographer. But in my capacity as a key informant (to my own project), I am arguably a para-ethnographer who is co-creating ethnographic analysis. Based on ongoing collaborative research, dialogue and analysis, the next step for Hanna and me is to further engage with communities in Los Angeles, including the food justice movement, food policy and food retailers interested in learning more about alternative approaches to food problems throughout the city. 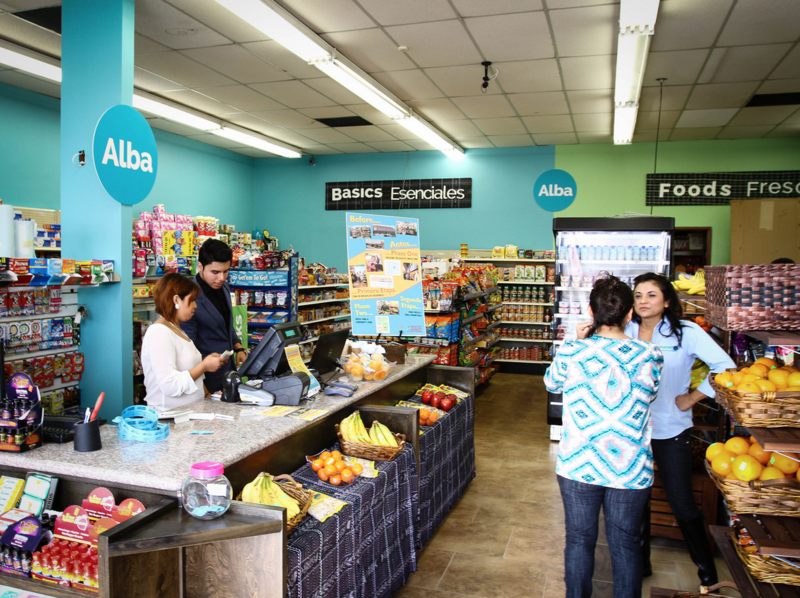 Some have already identified the unique market makeover of the Alba store as an example for potentially innovative approaches for changing the food environment in LA. We also plan to use our collaborative research insights to generate new forums for conversation and reflection about food policy and food activism in LA, including public and private events that we will both help coordinate, document and analyze ethnographically as they unfold. Our goal is to understand better how ideas and debates around food policy and food politics are shaped and reshaped through specific case studies, points of reference and innovation concepts. Once again, not only do we have the opportunity to ethnographically study this conversation, but we also have the capacity to create new forums, forms and directions for this shifting and emerging discourse. Certainly, there are no shortage of para-ethnographic examples among professional ethnographers and within the EPIC community. Outside of a more official “research” register, for example, I frequently rely on especially intuitive members of our firm’s client organizations to help provide insights and debate emerging interpretations about what shoppers are trying to accomplish and what they’re thinking about inside of a store environment. Those para-ethnographers might work in the marketing department or simply be observant team members who work inside of a grocery store, such as a sociable cashier or a caring butcher. I want to suggest that a para-ethnographic approach can generate unique opportunities—what I would call a para-ethnographic trajectory—that are especially revealing. In just one of many descriptions of para-ethnographic sensibilities in the EPIC community, Darrouzet, Wild and Wilkinson (2010) describe a model for participatory research that revolves around teaching members of a healthcare organization to think more ethnographically as part of the organization’s ongoing professional training, and then using those newfound faculties to assist in the professional ethnography team’s research and analysis. The recursive nature of this ethnographic research design model points to a trajectory of projects, contexts, fieldsites, ideas and insights that are all linked together in novel and unexpected ways. This trajectory relies on the roles of Darrouzet, Wild and Wilkinson to shift seamlessly between ethnographers, educators and strategists. Beyond the particular insights gathered in any particular project, I want to highlight the overall portrait of the project’s para-site trajectory, the larger arc of the story, as more significant and revealing. Taking this broader view, we can combine insights about how industries, organizations and users or consumers all work together in organized or disorganized concert. While professional ethnographers are already often engaged in a para-site trajectory, what we arguably lack is a recognition of the importance of this unique perspective and how it can come to bear as both a useful paradigm for the application of ethnography in industry, as well as a unique theoretical and interpretive framework with wider significance for the broader field of anthropology. There are multiple ways in which a para-ethnographic trajectory can positively influence professional ethnographic work, but here I will focus on the broader anthropology conversation. Although much of my own professional work is ethnographic or anthropological, I don’t consider the empirical details of the work I do for my firm’s clients as directly applicable to a more public conversation with the wider community of anthropologists, whether they are professional, applied, public or academic. In the case of the Alba store makeover, for example, I’m not interested in writing an ethnography of how people in this community actually eat or shop on a day-to-day basis. For one, that level of thoroughness is unnecessary for the purpose of the strategic redesign and rebranding project. But more importantly, I consider my more compelling opportunity to be telling a story from the unique perspective of a professional anthropologist with insight into the larger multi-sited workings of the food retail world. From this position, a single corner store intersects with larger narratives about food retail, supply chains, food justice and more. This is, as Tom McCarthy has described in talking about contemporary professional anthropology, one of those “arena[s] in which narratives and fictions, metaphors and metonymies and symbol networks at their most dynamic and incisive are being generated, worked through and transformed” (2015). My role and experience provides me with a way of looking at a food retail space that offers uncommon depth into the organizations and supply chains that exist behind the scenes. For example, I understand the back story of how consumer packaged goods companies work in this food retail space on a day-to-day basis, using direct store delivery associates to build positive relationships with corner store operators and influence the retail floor configuration inside of a corner store. And I have a grasp on the evolving relationship history between consumer packaged goods companies and food retailers that influences the larger shape of product supply chains, something which eludes direct observation at these sites. It is from this hybrid insider-outsider position—with its admitted privileges and accepted drawbacks—that I believe a productive and expansive set of intellectual discourses can emerge for professional anthropology. What I am describing here is not an “exposé” of nasty food corporations gone wrong, and I do not see any need to burn bridges with our clients or their industry practices. Instead, I am focused on building greater awareness about how this business really works—for storeowners, food activists and wider anthropological audiences. I believe this perspective has the power to influence the larger field of anthropology and, perhaps, society more generally. Thanks to Deepa Reddy and Natilee Harren for reading earlier versions of this article. Cefkin, Melissa. 2010. Ethnography and the Corporate Encounter: Reflections on Research in and of Corporations. New York: Berghahn Books. Darrouzet, Chris, Helga Wild and Susann Wilkinson. 2010. “Participatory ethnography at work: Practicing in the puzzle palaces of a large, complex healthcare organization.” In Ethnography and the Corporate Encounter: Reflections on Research in and of Corporations. Cefkin, Melissa, ed. New York: Berghahn Books. Garth, Hanna and Michael Powell. 2013. “A Collaborative Approach To Studying Food Justice In Los Angeles.” Anthropology News. October 2013 (54). Holmes, Douglas R. and George E. Marcus 2008. “Collaboration Today and the Re-Imagination of the Classic Scene of Fieldwork Encounter.” Collaborative Anthropologies 1:136-70. Marcus, George. 2000. Para-Sites: A Casebook against Cynical Reason. Chicago: University of Chicago Press. Michael Powell is a cultural anthropologist and brand strategist at Shook Kelley, a strategy and design firm in Los Angeles, CA. 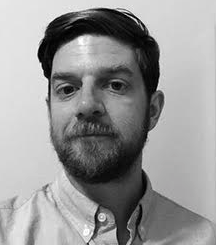 His current work looks at retail brands and the translation of strategy into the design of spaces and experience. He has a PhD in anthropology from Rice University. He has written for a wide range of publications, including The Believer, Huffington Post, Limn, American Anthropologist and Anthropology in Action.